A central heating system provides warmth to the whole interior of a building from one point to multiple rooms. When combined with other systems in order to control the building climate, the whole system may be an HVAC (heating, ventilation and air conditioning) system. Newer furnaces use blowers to recirculate the warmed air. Circulating air is drawn through a filter that helps rid the house of dust and other particles. Gas and oil furnaces have a pilot light that warms a heat exchange unit, which in turn warms the air before it is circulated back through the house. These furnaces have a flue where exhaust gases vent to the outside. An electric furnace uses heating strips, or elements, to warm the air. Your furnace plays an important role during the cooling system by circulating cool air throughout your home. By adding a new programmable thermostat you can enjoy better comfort during the day and conserve energy at night. Call Desert Air Conditioning Inc to discuss which system will work best for your home! Time for a New Heating System? Older systems of more than 10 years use a lot more fuel than the newer models. You should review the SEER (efficiency) rating of your existing system and compare it to the newer models. New units are rated at least 13 SEER which can reduce your electric bill. Desert Air Conditioning, Inc. delivers innovative, energy-efficient, products from most major brands. Desert Air Conditioning, Inc. offers our customer’s the most current, money-saving specials to help with your budget. Please click here to view our specials and current offers and rebates on quality products and services. 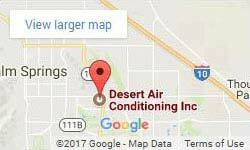 Desert Air Conditioning, Inc. has served the residents and businesses in the Coachella Valley since 1954. Our professionals are simply the best in the business and take pride in their work. Call us today to schedule your appointment for an estimate, repair or maintenance service.